Massive Massie work spottily read. I have been ambivalent ever since I heard his first narration. His diction in this book is rather poor with him swallowing the end of almost every sentence. 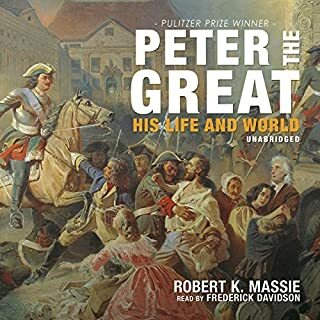 Was Peter the Great worth the listening time? I'm finding it a rather tough go. Suleiman the Magnificent, sultan of the Ottoman Empire and the most powerful ruler in the world, was determined to conquer Europe. 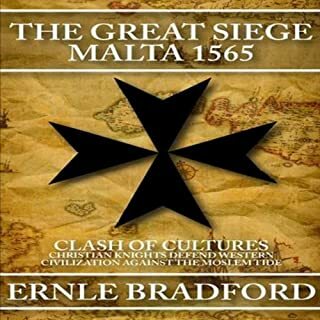 Only one thing stood in his way: the island of Malta, occupied by the Knights of Saint John, the Holy Roman Empire’s finest warriors. Determined to capture Malta and use its port to launch operations against Europe, Suleiman sent overwhelming forces. A few thousand defenders in Fort Saint Elmo fought to the last man. Classic Heroism, with modern resonance. What did you love best about The Great Siege? One of the less well-known episodes in a centuries' old struggle for mastery of the Mediterranean and Italy. Told with verve, detail, color, and appreciation for the mind-sets and virtues of the combatants. What was one of the most memorable moments of The Great Siege? The fall of Fort Saint Elmo. So, THAT'S where they got the movie from! As a youth I was thrilled by the (now) old-fashioned derring-do, color, and bravery of the movie "55 Days in Peking" with Charleston Heston, David Niven, Ava Gardner et al. The story of the "Boxer Rebellion" and its siege of the foreign legations in Peking in 1900 was drawn from this book. Well-written, well-paced, and very well read! The only quibble is that the book reflects its provenance ( UK, 1959) when the author quotes Frenchmen in their original French and leaves their words untranslated. 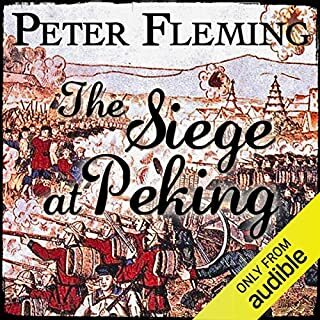 One supposes Peter Fleming assumed any educated person could handle a few sentences in French ;-) However, at least the French is well-pronounced by the narrator. 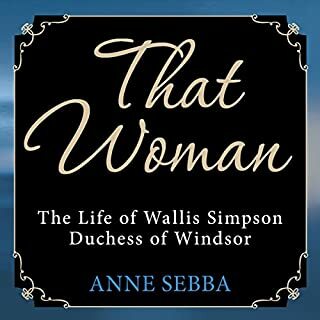 Anne Sebba's book on the Duchess of Windsor was interesting and full of detail. Her speculation on Wallis' physical-sexual condition while seeming a little speculative provided a possible explanation of how a thrice-married woman in an era of little or no contraception never had a child and often struck observers as having an almost masculine persona. The book also provided some real insight into her two prior husbands who often seem shadowy figures in most other accounts. The last, unfortunately, of William Manchester's planned multi-volume biography of WSC. I purchased and read the book many years ago. As I had some driving time ahead this summer I thought it would be fun to re-visit it by istening to it in the car. Mistake! The narrator makes the book very difficult to listen to. He has an odd tendency to swallow final syllables of words making it hard at times to understand the meaning. Also, he cannot resist the dreadful temptation to "imitate" Churchill when his words are quoted; which is very often of course. A splendid book; written in an admiring yet appropriately critical spirit. 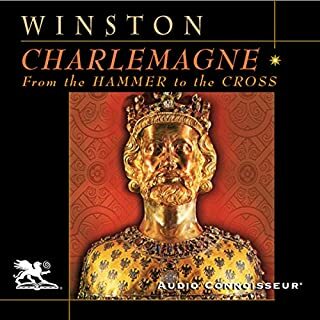 The author makes Charles come alive both as ruler and as a human being. The recording has some "hokey" elements ( music, sound effects, reverb) but is well presented. However, someone needed to coach the narrator on correct Latin/French pronunciation. But on the whole, well worth the listening. 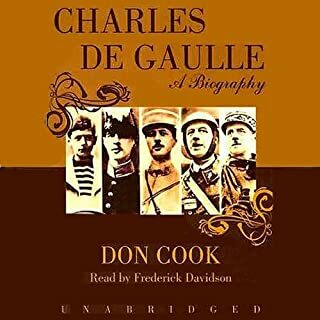 This magnificent volume by veteran European correspondent Don Cook is the first major biography of de Gaulle written by an American from an American perspective. Rich with new anecdotal material, it offers fresh evaluations and sheds new light on Europe's most controversial and enigmatic general, politician, and statesman. This magisterial biography is well known in the vast literature on the subject character. It is well recorded by and large, but here I venture some reservations. I have found this particular narrator to be a bit too "arch" and "overly-Britsy" for me taste, though he has done several of the serious history works I've purchased. Someone does however need to correct pronunciations e.g. : the British battleship "Resolution" pronounced as if it were a French word; and the well-known American Admiral Leahy prononunced as "Lee-hee". Minor yes, but annoying. Also there is a practice I've noticed in other recordings: the tendency to imitate the real or imagined voice of someone quoted. 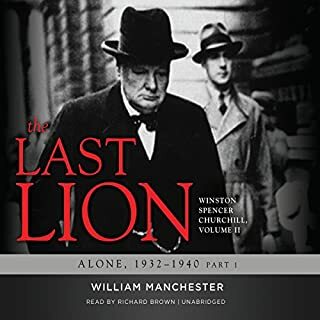 Here Churchill is given a sort of commonplace imitation treatment by the narrator. I'm not sure if this practice is professional or too "show biz" for me. 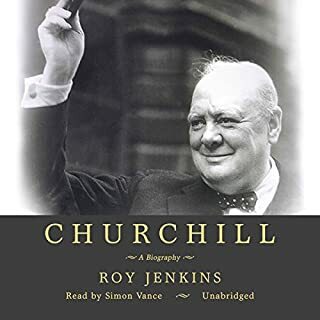 No doubt the late (Lord) Roy Jenkins' biography of Winston Churchill is a most enjoyable, detailed, and balanced account of WSC's extraordinary life. Not as exhaustive (perhaps exhausting) as Sir Martin Gilbert's official biography, it is nonetheless thorough and enlivened by the author's own long experience in British politics and government. The narrator is clear and engaging; but was allowed to convey direct quotes by using different accents and tones of voice. When it comes to him reading WSC himself, it becomes annoying as the man's voice himself is so well known and his own recorded speeches so readily available. On the whole, however, very well worth the listening! 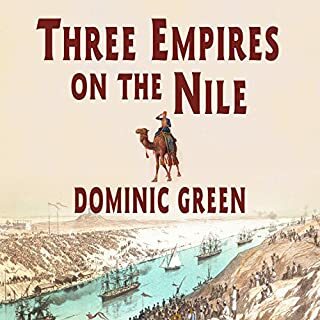 Three Empires on the Nile tells of the rise of the first modern Islamic state and its fateful encounter with the British Empire of Queen Victoria. Ever since the self-proclaimed Islamic messiah known as the Mahdi gathered an army in the Sudan and besieged and captured Khartoum under its British overlord Charles Gordon, the dream of a new caliphate has haunted modern Islamists. The 19th-century origins of it all were even more dramatic and strange than today's headlines. A beautifully read absorbing story of Khedives, Mahdis, imperialists, "Chinese" Gordon, Kitchener of Khartoum, the Sudan, the Suez Canal, etc. Today it's the Taliban, Darfur, Islamic fundamentalism and jihad. A timely book. It also got me to rent the 1966 Charlton Heston, Laurence Olivier epic film "Khartoum" which is remarkably accurate. The author is modern in his lack of reverence for the British "protectors" of Egypt but holds no phony politically correct view of militant Islam either. Held my attention and the narrator was very easy on the ears. Paul Johnson's book is a refreshing return to a concept whose time has come once again: the Great Man theory of biography. It serves as "the greatest possible refutation of those who hold that events are governed by forces, classes, economics, and geography rather than the powerful wills of men and women". Napoleon truly was the Great Man of his age, a towering and terrible genius who managed to conquer the Continent. Paul Johnson does a good job in this relatively short book in objectively examining, and demolishing, the shallow cult of Bonaparte. He reinforces what Churchill observed: that Napoleon was as great as a man could be, without being good. Johnson does make one elementary error that surprised me however: he conflated Napoleon's brothers Lucien and Louis as if they were the same person. One would think such a basic error would have been picked up in the editing.